Surprising, as it may seem, the most important part of an athlete's diet isn't what they eat, it is what and how much they drink. Hydration before, during and after exercise is especially important for preadolescent children because they have special fluid needs  compared to adults, or even teenagers. 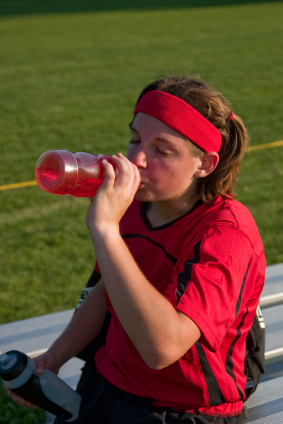 As a parent or coach, you are responsible for taking precautions  to prevent heat illnesses  in exercising children and making sure they drink enough fluids. To keep from becoming dehydrated , your child should drink fluids before, during and after exercise. To promote fluid intake in kids, fluids containing sodium (i.e. sports drinks ) have been shown to increase voluntary drinking by 90% and prevent dehydration  compared to drinking plain water. Recent research suggests that a "one-size-fits-all" prescriptive advice to drinking is outdated because sweat water losses are dynamic and dependent on the intensity of exercise (higher metabolic rate, more sweating, more water loss); the ambient temperature (the hotter the conditions, the greater the amount of evaporative sweat production); and body size (bigger the mass, more evaporative sweat needed to cool the body). These three main drivers of sweat water loss are highly variable in children. Drinking fluids prior to exercise appears to reduce or delay the detrimental effects of dehydration . Adjust fluid needs during practice according to the weather , amount of equipment worn, and practice duration and intensity. Cautionary note: Encouraging children to drink fluids does not mean encouraging them over-drink, which can expose a child to the risk of a dangerous, potentially life-threatening condition called hyponatremia .